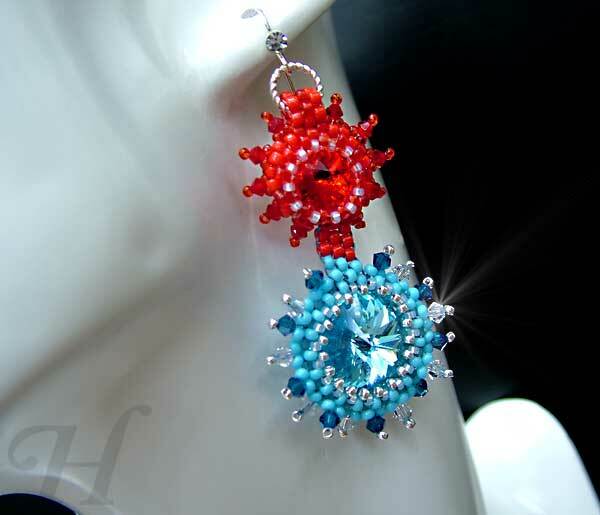 I had a lot of pleasure in making this Fire and Water handmade earrings. 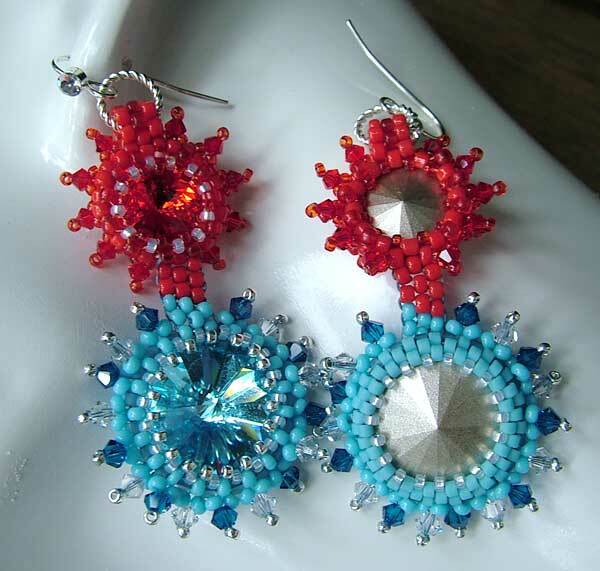 Ever since I was asked to make the Red Sun earrings, I have been on a rivoli spin! This is the second in that wild ride of a spin. 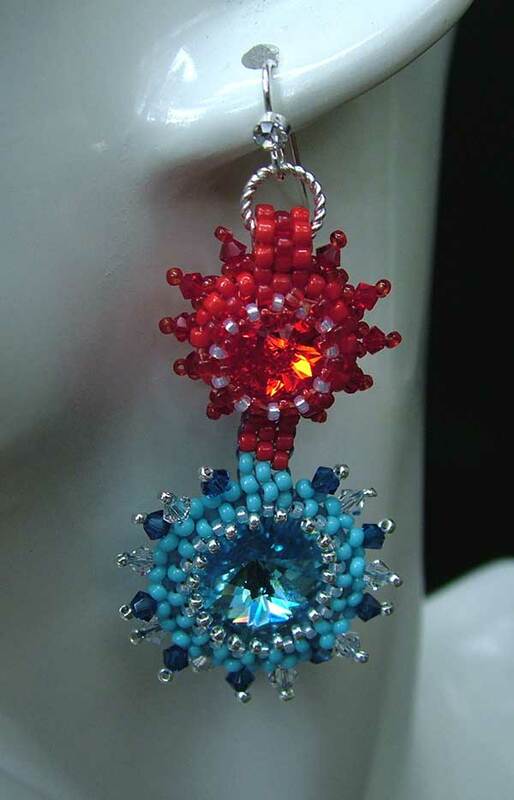 The combination of Swarovski Rivoli blue Aquamarine and red Light Siam calls to the very elements in their reflection of the sparkling, peaceful flow of soothing waters and the mesmerizing fire depths of the reds. As per usual, I have quite a lot of photos. I always find that I love lots of photos when I am looking at the works of other people. From lots of angles if possible so that I can see the close-up of the details. There is always so much in the details that one can glean information from. Hence, I have the tendency to provide lots of large photos whenever possible. 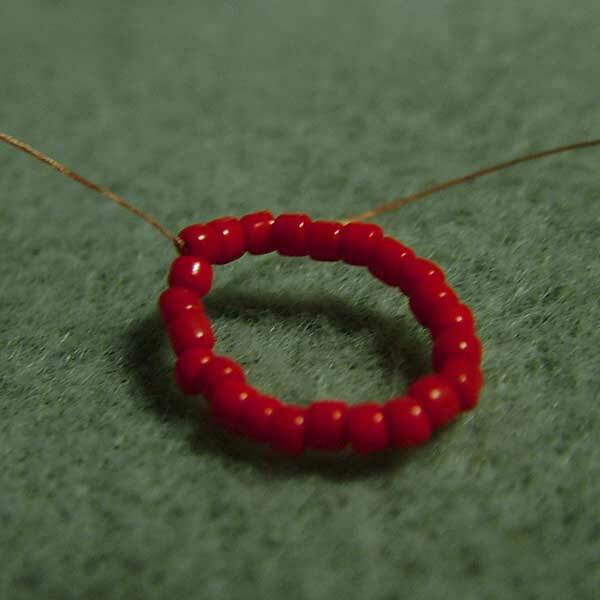 Beaded bezel around a rivoli stone with peyote stitch. 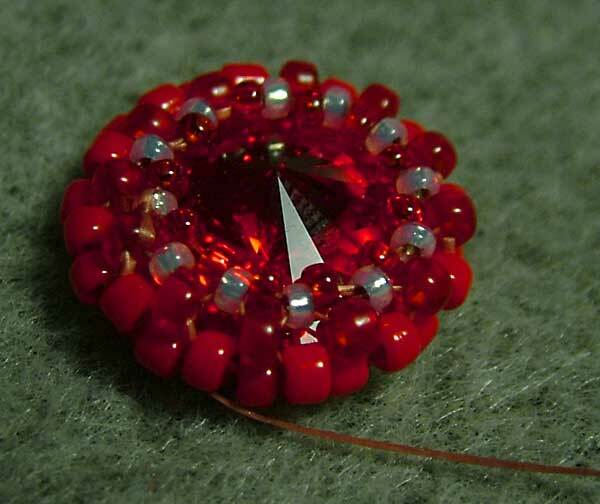 Here in this mini-tutorial walk through, I am concentrating on the steps to make the red (Light Siam) rivoli as the process is much the same for any beaded bezel rivoli. 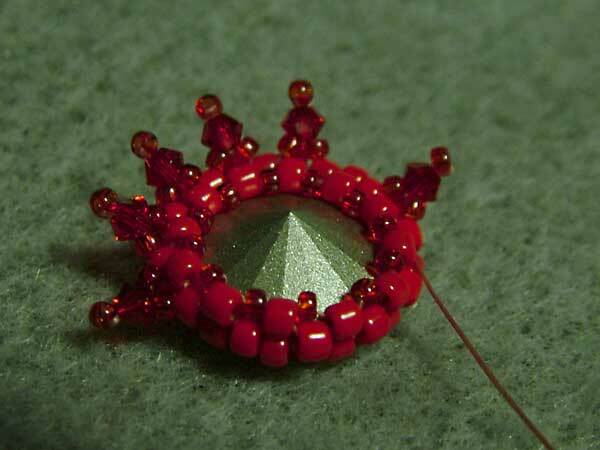 Again my work photos are a bit on the darker side as I seem to do most of my beading work by the light of the night. 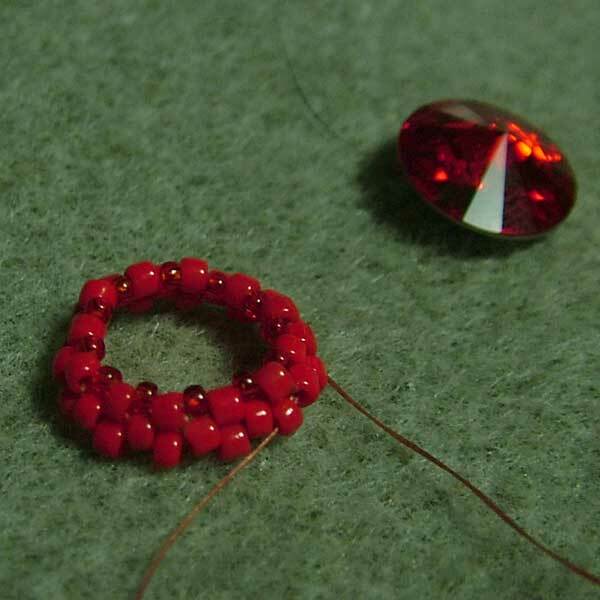 Thread a ring of beads to fit as closely as possible around the rivoli round stone. 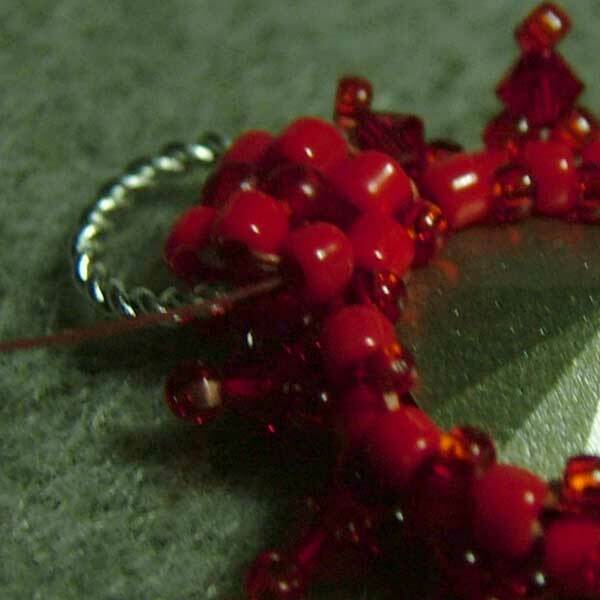 (Here I used 24 Miyuki 11/0 seed beads for the 12mm Light Siam, and 38 beads for the 16mm Aquamarine). 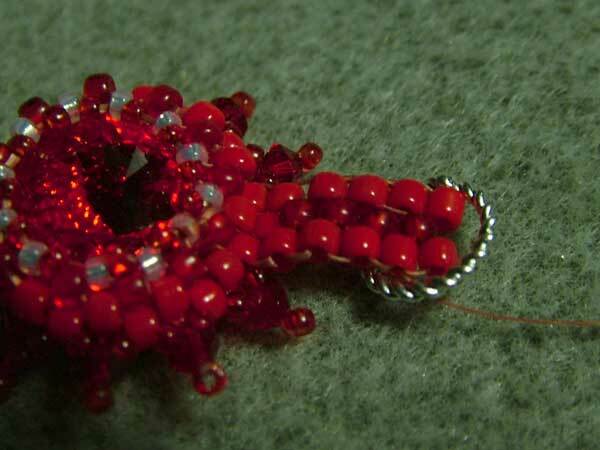 Then work a normal (tubular) peyote stitch. In my mind, I count this as 3 rows. 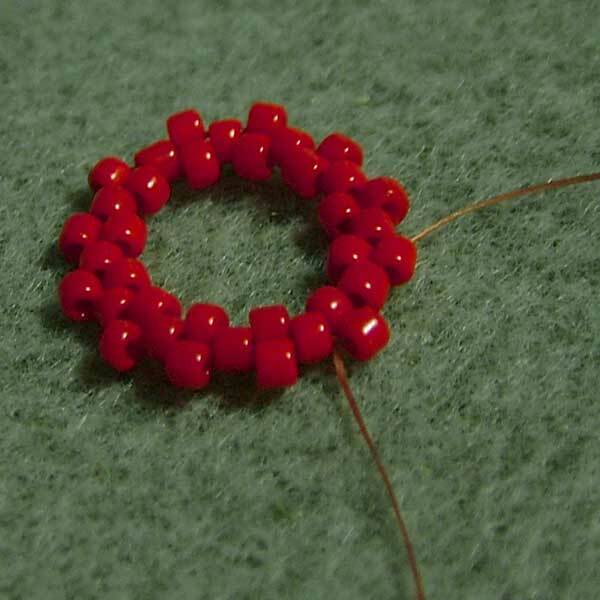 Then the "clincher" row for the back - working a row of peyote stitch with smaller 15/0 seed beads. Pull snug and tight to clinch in the back. 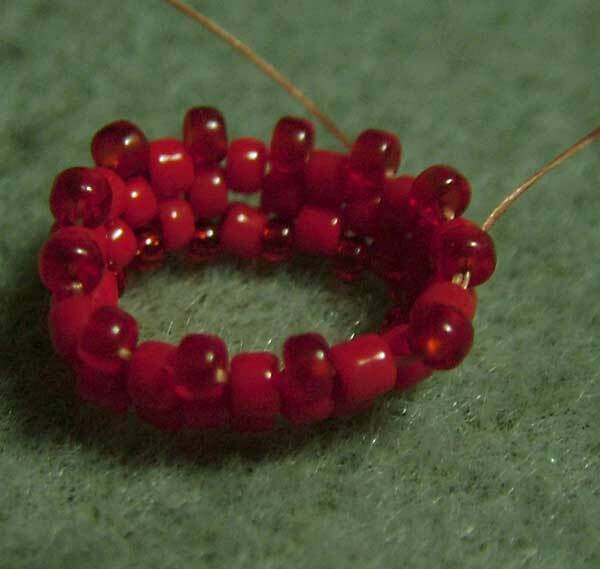 (For bigger stones, sometimes I do 2 rows of "clincher" rows with the 15/0 beads). Then for the front of the rivoli, I built up another row of peyote stitch (using a slightly different colored bead in 11/0). This gives a nice "cup" for the rivoli stone to sit in. I know the following photo does not show it really well, but this is where you sit the rivoli stone as snugly as you can into the peyote "cup". I made 2 rows of "clincher" peyote with the 15/0 seed beads to clinch the front/top and hold the rivoli firmly in place. 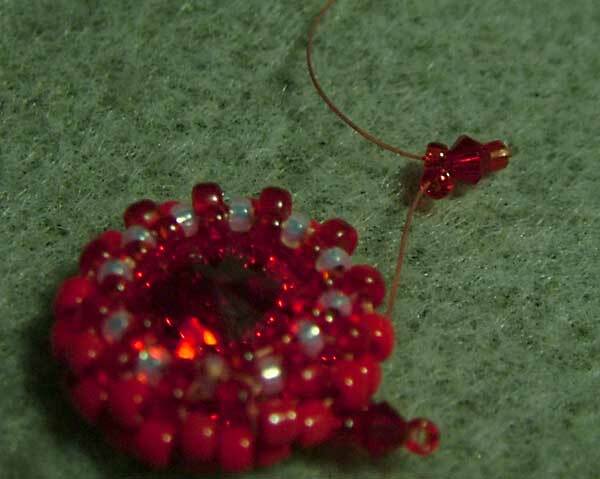 Work the "star spokes" all the way round, remembering you will have to leave a space to make a peyote bail/loop. 1) the number of rows you make to create the bail as you will be duplicating this exactly for the other rivolis. 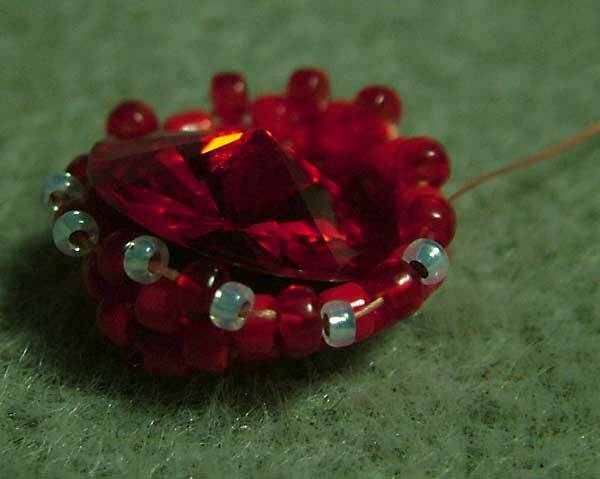 2) to include a closed ring before you stitch down the bail. 3) when working the lower rivoli, remember that it's bail has to include/link to the closed ring already set in place on the upper rivoli. Work the peyote bails as seamlessly as possible, front and back. Weave in extra thread and finish. 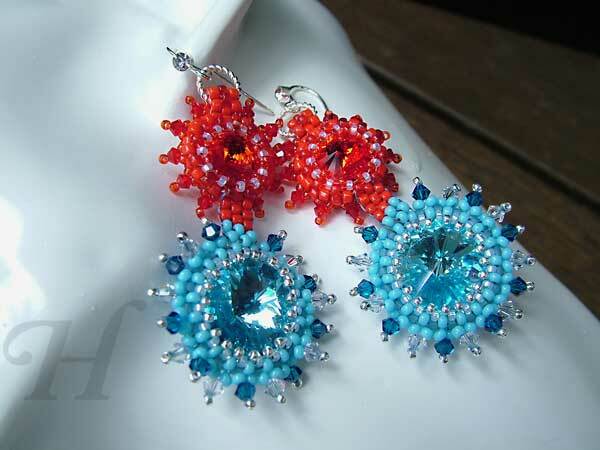 That's it for this handmade earrings. 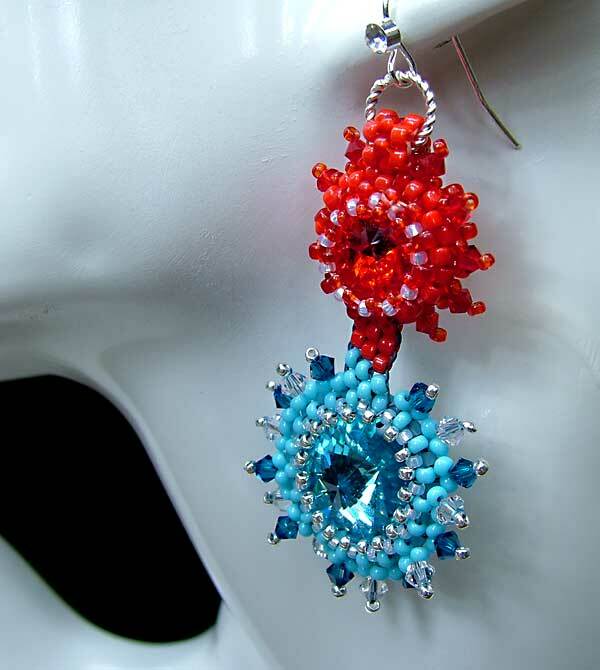 The next photo shows the finished earrings - front and back.